An iconic, idiosyncratic anomaly in a creepshow category overrun by reanimated bodies and rotting monsters. In the repetitive and often routine world of horror, it's hard to stand out. Being different requires a mindset not normally found in mainstream macabre, a desire to work beyond genre boundaries to discover something new, something novel, or something unknown. It doesn't always work, and usually turns your terror take into a strange, surreal excuse for recognizable entertainment, but even the most minor success shines beyond the standard staid scary movie. Enter Psychomania, otherwise known as The Death Wheelers to those in the in the twisted home video retitling know. This 1973 British biker film has the distinction of being the final effort of Golden Era limelight George Sanders. But it's the juvenile delinquent zombie angle that really separates this mad movie from the rest of the pack. Tom (Nicky Henson) is the leader of a motorcycle gang known as The Living Dead. Driving around rural England causing all kinds of havoc, he is obsessed with his late father's unusual death. Asking his mother (Beryl Reid) and her ageless manservant Shadwell (Sanders) for answers, he discovers something weird - both hold the secret to coming back from the dead. All you have to do is believe and you will rise from the grave. After some frog based hocus pocus and a locked room freak out, Tom commits suicide and sure enough, returns from the great beyond (chopper intact). But instead of looking like a rotting corpse, he's a flash fresh version of himself. Oh, and he's also invincible and invested with super strength. After going on a few killing sprees, he convinces the rest of his cohorts to follow him into immortality. Only sheepish girlfriend Abby (Mary Larkin) seems unsure about the suicide/resurrection pact - and that just won't do. To call Psychomania (new to DVD from Severin Films) "unusual" is to impart the film with a major/minor level of undeniable ludicrousness that it easily earns. A low budget and rent romp that clearly was made on the intended commerciality cheap, it's lack of legitimate scares is easily overwhelmed by the sheer audacity of its ideas. Let's face it, this is one bugnuts movie. In essence, Tom's mother sold her soul to...someone...in order to hold the key to life after death. Cemetery amphibians, mod motorcycle helmets, and the most wholesome Hell's Angels on the planet are apparently a byproduct of such pagan spirit shilling. As an action film, you'll find few better. Aussie director Don Sharp was a whiz at bikes through traffic tricks, and there are several set piece chases that literally take your breath away. But if you're looking for the shivers or something to tingle your spine, you're really out of luck. This is when camp and pure schlock kitsch step in. Because of their look, their weird brawlers meet the Bugaloos fashions sense (including their leader's skin tight leathers), Tom's gang is an absolute hoot. They have hilarious nicknames like "Chopped Meat" and "Gash" and spend more time posing around a faux Stonehedge in their macrame vests than truly terrorizing the population. Once they go zombie, however, they really up the anarchic aggression. One memorable bit appears lifted from the Herschell Gordon Lewis classic Just for the Hell of It. It involves a grocery store, several of Tom's toadies, and a conveniently placed baby carriage. While we are supposed to believe these are the worst of British baddies, The Living Dead come across as more misguided than mean. Tom may be a terror, but Abby and the "Hatchet" are uneasy recruits at best. Heck, one even fancies himself a wispy haired troubadour (and sings a crappy folk song to prove it). Then there is the entire Sanders/Reid subplot, something that makes little or no sense outside Psychomania's stunted universe. We are introduced to the duo during a séance, Tom's mom affecting a child's voice in order to "prove" her psychic abilities. We later learn that she's probably legit, a legend revolving around black magic and seven witches being turned to stone as part of her powers. Sanders, on the other hand, appears to be part Satan, part servant. He obviously knows more than he is letting on and yet, during one crucial moment before Tom returns, plays everything very cloistered and close to the vest. Their weird secret vibe gives this movie yet another memorable erroneous element. From killings that aren't very convincing to stunts that will wow your post-modern sensibility, Psychomania stands alone. As part of their DVD release, Severin films unlocks a cavalcade of intriguing bonus features. The best is a collection of interviews with several members of the cast, including Henson, Larkin, and other parts of Tom's "gang". They all report on the silly script they were sent, the desire to spend six weeks "riding bikes", and the professional brush off they felt from Sanders and Reid. Even more revealing are the technical ins and outs for some of the action, including a memorable fall into oncoming traffic. We also learn about the various musical cues in the movie (all psychedelic rock - about five years too late) and how Fangoria editor Chris Alexander first came across the film. His story of collecting off title VHS tapes will spark a sense of nostalgia in anyone who grew up scouring Mom and Pop video stores during the '80s. But it's Psychomania itself that wins the day. It remains an iconic, idiosyncratic anomaly in a creepshow category overrun by reanimated bodies and rotting monsters. Sure, fright fans like their zombies hobbled and hungry, patrolling the countryside for available brains. All the members of The Living Dead want to do is cause trouble and "blow some squares' minds". While it may have been intended as nothing more than double feature filler, a 90 minute companion piece to something more substantial, it actually wound up doing what few horror films can - it set itself apart from the rest of the paranormal pack. Cinematic scares are often predictable at best. 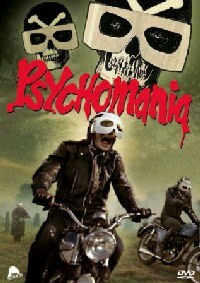 While it avoids many of the basic bone rattling moves, Psychomania is still one memorable fright flick.